When you register, you’ll see 2 boxes on the form listed under Optional items. One if for pre-ordering the Limited Edition Carolina Fiber Frolic Spring 2016 bag, and the other is for ordering a Kit: One bag and One coordinating self-striping color way yarn, Birds of a Feather, dyed by the amazing Joan of Lollipop Yarn. Both the bag and sock yarn are available only as pre-orders for those registered for the retreat. Want to see pictures? Of course you do! The bags are made from decorator weight fabric on the outside, and a sturdy solid color lining, plus a fun useful interior pocket! There is a Carolina Fiber Frolic Spring 2016 label sewn into the side of the bag and the handle attached to the zipper is made from the bird fabric also. The bags are large enough to hold a sweater project or multiple smaller size projects at the same time. The yarn is Lollipop Yarns in the Gripes base, which is a lovely sock weight yarn that is 80% super wash merino & 20% nylon for added durability. The sock yarn is called Birds of a Feather (that Joan – she’s a smart one! ), and has 5 different color stripes, each separated by a wider strip of the light blue-aqua color called, of course, Fiber Frolic (I did mention that she’s smart, right?). Please note: both the bags & the yarn are only available in limited quantities and must be pre-ordered. The early registration discount ends on February 15th, so you’ll save yourself some money if you register before then. Hope to see you in the mountains next month! Today I’m sharing preview information on the Spinning Focused classes that will be offered at the March 18-20, 2016 Carolina Fiber Frolic Retreat. Handpainted combed tops and dyed locks can be found in a plethora of colors. The way the colors mix and shade in the fiber is often what draws us in, but can look “muddy” when spun into yarn. Come learn a variety of ways to prepare, combine, draft, and ply these beautiful fibers to give you the yarn you want. We will work with several different types of wool and a few luxuries like silk and yak. After your yarn is spun and wound into a skein, what comes next? Finishing handspun typically involves washing, but the exact approach depends on the fiber and spinning method used and what type of textile you want to make. Wet-finishing can be used to remove carding oils and excess dye, but can also add strength and durability or loft and halo depending on the method. This workshop will cover three common approaches to wet-finishing: washing, fulling, and blocking. We will spin a variety of fibers and yarn types, ranging from singles to tailspun, and finish them using different techniques. You’ll leave class with the skills you need to add a perfect finish to your handspun beauties. Sheep around the world are beautifully diverse. Join us for an introduction to a range of sheep breeds and the characteristics of their wool. You will have a chance to handle fleeces and yarns from primitive, longwool, down- type, medium, and finewool sheep. Kate will offer tips on choosing the right wool type for your next project and resources for finding breed-specific fibers. Leave class with a notebook of the breeds covered in class and a better understanding of how wool type impacts the durability, resilience, and drape of your textiles. Bring your spindle or wheel, knitting needles or crochet hook, to sample fibers and yarns. Inspiration is everywhere. The challenge for fiber artists is in translating interesting architecture, a sunset, or a memory into yarn and textiles. In this workshop, Kate will walk you through her own design process and help you begin a spinner’s creativity notebook. Building upon color studies and explorations you develop in class, the workshop will cover fiber preparation and spinning techniques used to manipulate color, managing handpainted fibers for different color effects, finishing techniques, and more. You’ll leave with an organized notebook filled with samples and ideas, and the tools needed to turn them into beautiful yarns. I know I would love to take every one of these classes….. You? One of the changes we’re making to the Spring Retreat registration process is to post information on the classes prior to registration opening, so that you’ll have a chance to think about what classes you most want to take before having to submit your registration. Hope you like this change! Description: Fair Isle knitting uses two or more colors per row to create gorgeous colorwork items. We’ll cover the basics of Fair Isle and get the hang of working it while knitting a hat with a simple motif. Skills students will learn: Yarn management, methods of tensioning for Fair Isle, yarn dominance issues, choosing colors for Fair Isle patterns, reading Fair Isle charts, decreasing in pattern, weaving in ends. Description: Steeking a garment is a way to allow a knitter to knit it entirely in the round. It is especially useful in Fair Isle garments. Steeks can be used at cardigan fronts, armholes and necklines as well as many other places. Taking scissors to our hard work can be daunting, but don’t worry – you will have help and guidance while you cut for the first time! Skills students will learn: We will cover several ways to reinforce your knitting prior to cutting. We will then cut our knitting – yikes! We will also cover picking up and knitting stitches at the steek seams, and ways to secure the steek edge. Description: Thrummed items are soft and cozy. They are also a good way to use some of the luxurious fiber you have in your spinning stash! We’ll learn the basics of knitting mittens and working with thrums in this class. Description: Short rows are a great way to add shaping and interest to items. There are many ways to work short rows. In this class we will sample several of the different ways to perform them. ‘Wrap and Turn’ short rows, Yarnover short rows, German short rows, Japanese short rows and others as time permits. Description: Whether you have yet to knit your first sock, or you’ve knitted several, this class has something for you! We will cover the basics of sock construction – both cuff down and toe up – and different heel and toe treatments. We will also cover grafting and different cast ons for both cuff down and toe-up knitting. One or more ‘class socks’ will be knitted with the techniques each student wants to try out. Skills students will learn: Using dpns. Magic loop technique. Two circ technique. Cuff-down sock construction. Toe-up sock construction. Heel flap heels, short row heels. Wedge toes, spiral toes. Ideal cast ons for cuff down socks. Kitchener stitch. Cast on methods for toe-up socks. Plus any other sock technique that you want to learn, and we have time for, we’ll cover! I plan to post the spinning focused classes tomorrow! The fall Carolina Fiber Frolic Retreat is all retreat! Bring what you would like to work on and receive support, encouragement and time to enjoy your crafting. Our goal: minimal scheduling, maximum fun, relaxation, and an all around creative, supportive environment. A great venue, buffet style meals, new and familiar fiber friends all together in one place; life doesn’t get any better than that for fiber lovers! Come by yourself, or bring family / friends, but plan to make new friends when you arrive. Bring your spindle, wheel, knitting needles, crochet hooks, felting supplies, and/or portable loom. Spend the weekend relaxing, spinning, weaving, knitting, crocheting, and enjoying this great retreat in the North Carolina mountains! Registration is limited, so register early to ensure your spot. If the retreat fills before your registration is received, you will be issued a full refund. The retreat fee includes access to the retreat center, Friday Lunch and Dinner, Saturday Lunch and Dinner, Coffee and Tea, and Happy Hour both evenings. Cancellations received in writing before October 1st are eligible for a 75% refund of registration fees. Fees are non-refundable after October 15th. Sales Opportunity: We don’t have commercial vendors at the Fall Retreat, so this provides an opportunity for All Participants to bring items from their stash that they no longer plan to use, OR other items you make: jewelry, handmade books, handspun yarn, photographs, hats, project bags, shawl pins, homemade jam, etc. We’ll provide tables for display and sales (time TBD). Start looking through your stash and craft room and start planning what you’ll bring. 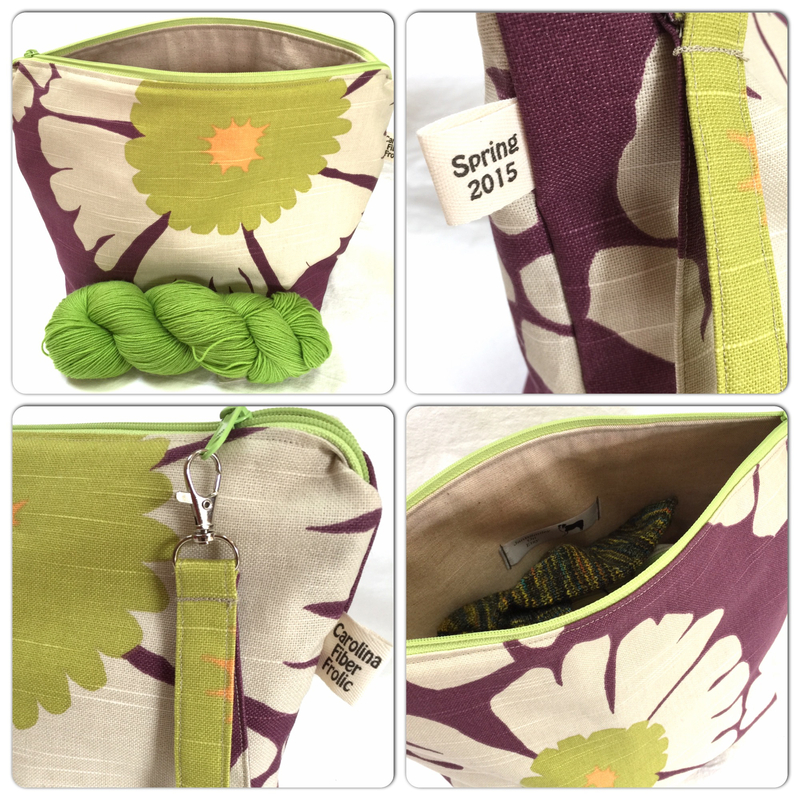 A Limited number of Fall 2015 Carolina Fiber Frolic Retreat Project Bags will be available for pre-order (sneak peek image below). The fall 2015 retreat bags are a generous size suitable for a large shawl project, a sweater, or several smaller WIPs so you have project options when you’re out and about. The bag comfortably holds 600 grams of yarn. The primary fabric is a decorator weight woven chevron design, the base & handle (on a swivel clasp) is a deep purple hand-dyed hemp twill, the lining is a durable neutral color fabric, and each bag will have a small pocket for stashing stitch markers, tape measure, yarn labels, etc. 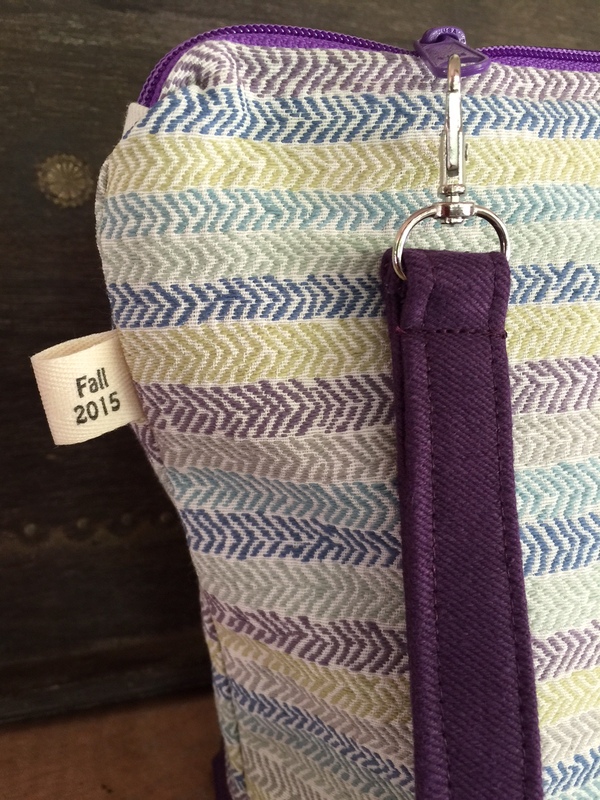 They have purple zippers, and a special Carolina Fiber Frolic Fall 2015 tag. If you would like to have one waiting for you when you arrive, please indicate that on your registration form. Hope you’ll be able to join the Frolic in the mountains this November 13-15! Spring 2015 Retreat is Full! Wow – 2 weeks into registration for the 6th Annual Carolina Fiber Frolic Retreat & the event is Full! Due to space limitations, we will not be able to accept any additional Retreat applications. Yay & a Big Thank You to those who sent in their registration and received confirmation. If you sent in your registration & have not received an e-mail response, please contact me. To those who will not be joining us this spring, we hope to welcome you to a future Carolina Fiber Frolic event – subscribe here to learn about the fall Retreat dates and additional information about future Retreats! Here is a sneak peek at the limited edition bags for this spring’s March 20-22, 2015 Carolina Fiber Frolic Retreat. As you can tell by the 100 grams of yarn for scale, these are large sweater size bags, or are also great for numerous smaller works in progress. Each bag is approximately 15.5″ tall, 10″ wide at top and 6″ deep at the base. The outside is decorator quality linen-textured fabric, and the linings are organic cotton twill. Each bag will have a nice pocket inside for you to keep a few notions, money for coffee, yarn labels, etc. All bags have a swivel handle and spring green zipper. Ordering a bag is as simple as checking the box on your registration form before you send it in. Hope to see you at the next Frolic! So happy you are interested in more information (& hopefully attending) this fall’s Carolina Fiber Frolic Retreat!! The retreat site is in Sapphire, North Carolina, about an hour southwest of Asheville, in the North Carolina Mountains. We have a wonderful venue with walls of windows for natural light, rocking chairs on the wide covered porch overlooking the stream if the weather is warm, as well as double sided fireplaces inside if there’s a chill in the air. Nooks, alcoves, and a library loft just beg for you to pull up a chair, your knitting or spinning (or whatever fiber craft you’re currently enjoying) and enjoy time with new and familiar friends. The fall Retreat is “All Retreat”, which means there are no formal classes offered (we have those at the spring retreat); however, that doesn’t mean you won’t learn something amazing from the person sitting next to you at any moment in time! So plan to bring whatever fibery projects you are interested in, new projects you’ve been meaning to get to, problems projects that you’d like help trouble shooting, and allow yourself a lovely weekend away from your regular routines. Also included in your registration fee: Friday and Saturday catered lunches, Friday evening taco bar, Saturday full dinner, happy hour both evenings, evening activities & contests, an opportunity to sell/swap stash items or other items you make (more info on that on the registration form), coffee-tea-sodas and snacks during the day, and the priceless gift of time to relax, make progress on your WIPs, laugh, and enjoy yourself for the entire weekend. Piqued your interest? Click the link on the right side bar to access the registration form. Post here or join in the Ravelry group (Carolina Fiber Frolic) if you have any questions; we’d love to welcome you this fall to the Carolina Fiber Frolic Retreat! Save the Dates for the next 2 Retreats! Let me know if you have teacher recommendations, suggestions, or class topics that you are particularly interested in. I’m compiling lists and sending out queries, and would love to know what you’re especially interested in, or think you will be interested in next spring. More information will be posted here as registration information is available. Spring 2014 Retreat was Wonderful! It was a wonderful weekend that went by too quickly!!! Thanks to all our instructors, vendors, caterer, but most importantly: Thanks to everyone who attended!!! All who came, whether long-time friends or new friends attending for the first time, are a great group of people who welcome the opportunity to gather, play, produce, learn, eat, laugh, and enjoy a fiber filled weekend. The Carolina Fiber Frolic Retreat is a great event because of the participation of great people! Once the fall Retreat and next spring’s 6th Annual Retreat dates are set, I’ll post them here. Until then, have fun creating with fiber!